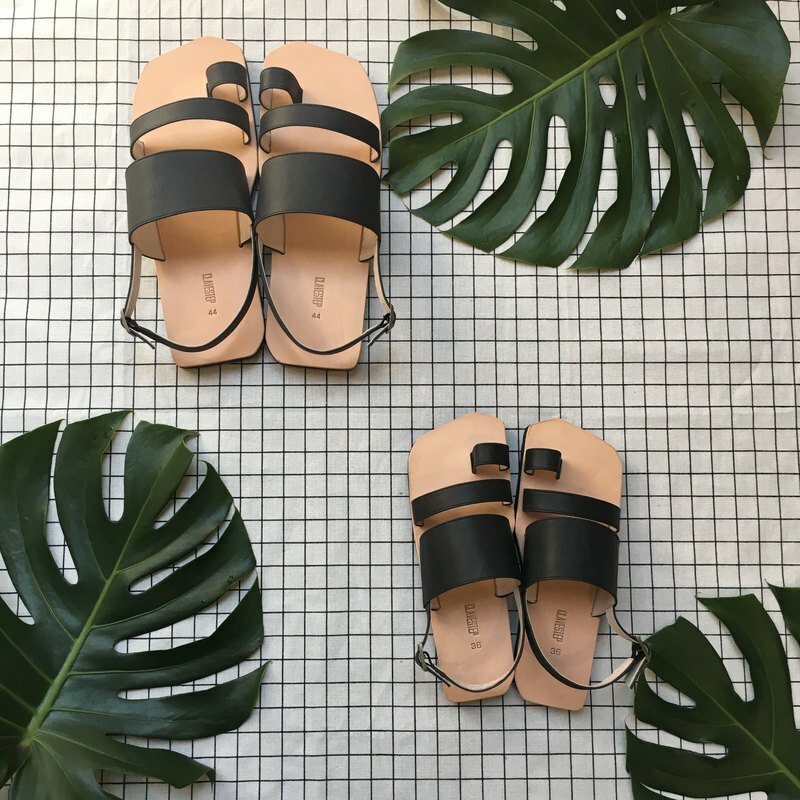 The new square design is a break away from the traditional rounded shape of slippers and sandals. / Product description / [CLAVESTEP XIII Sandals] Leather Sandals - Thirteen - Deep Blue The new square design is a break away from the traditional rounded shape of slippers and sandals, and allows the feet more comfort when wearing the shoes and walking, and we are making it available in sizes for men, women and children, as well as accepting orders for customized colors. The shoes can be worn indoors or outdoors. Three-strap sandal design represented by the Roman numeral XIII. Original-design series of shoes with multi-angle edging trim made using a branded knife mold we developed ourselves to cut the edge of the outsole. The insole is made with imported Italian leather which allows ventilation and is highly comfortable, and which becomes a deep amber color with wear. The outsole is made from a Rubberlon base. / Product Specification/ Outsole Height：16mm Size	EUR : 35 / 36 / 37 / 38 / 39 Foot Length-cm : 22.5 / 23 / 23.5 / 24 / 24.5 / Material / Upper：Leather Lining：Leather Insole：Leather Outsole：EVA Accessories：Metal / About Brand / One , two, three, four. One , two, three, four. People are swinging with their longings of naive. Following the musical notes, high-heel shoes are dancing. A distinctive rhythm is established with the beats. I heard your footsteps echoing as rhythmic as CLAVE. / About Designer / Art thrive the life and the life is in blossom by art. Held a great affection by how different the outlook could be with a petite accessory, keen for more spontaneous accessory design. / Use and Care / If the leather product is exposed to water, gently wipe the water off with a dry cloth and leave it in the shade to dry. Do not blow-dry or put the product in direct sunlight. If you are not using your leather product, put it back in its (a) dust bag, and store it in a cool and dry place. Every piece of leather has different grains, creases, and may even have scars or spots. This is a special feature of leather products. HAND MADE IN TAIWAN This product is handsewn. The actual sewing may be slightly different from the product photo. This cannot be counted as a defect.